A producer of high quality craftsman designed hand-thrown domestic stoneware pots of handsome and distinctive design, oven/dishwasher and microwave compatible. Something with that little bit of difference. My studio is located alongside the Caldon canal at Consall Forge, an idyllic situation in the heart of the Consall Nature Reserve and R.S.P.B. sanctuary. 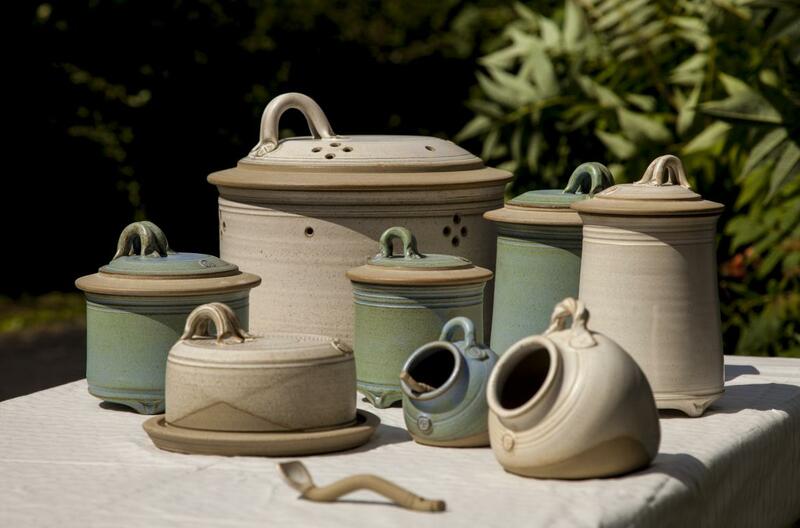 I produce a comprehensive range of domestic stoneware specialising in teapots. There is a peace and tranquillity about the place that I mirror in the quiet colours and textures of my work. By working on small batches of each item I successfully blend repetition with individuality, maintaining a freshness and vitality of form that is often missing from production thrown ware. My philosophy for potting is to keep designs simple and to put great emphasis on craftsmanship and function. "Pots I make are mainly for use, why own a beautiful functional object and not experience the pleasure of using it for the purpose for which it was intended".